Black Forest has some of the most spectacular and comfortable homes in the region nestled within a sweeping blanket of pine trees just a few miles north of Colorado Springs. About 13,800 residents call the area home, and live in almost exclusively single-family homes. The median price of homes here is $387,000. In addition to spectacular views of Pikes Peak to the southwest, Black Forest is also home to one of the best parks in the area, Fox Run Regional Park. The park features over 4 miles of trails, picnic pavilions, playgrounds and two ponds. 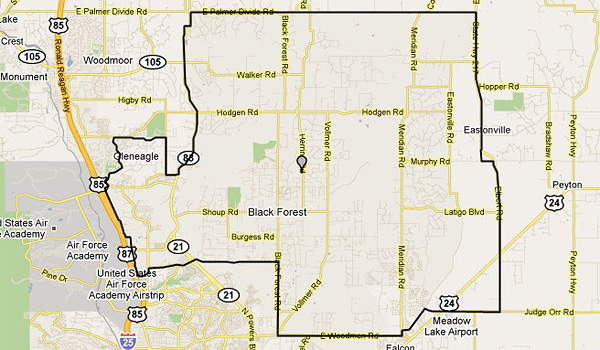 Black Forest is also adjacent to the Air Force Academy directly to the west. The primary school district in Black Forest is the highly accredited District 20. Some of the schools in the area are Air Academy high school, Falcon High School, Edith Wolford Elementary School and Discovery Canyon Campus. On the western side of Black Forest, I-25 provides easy access to downtown Colorado Springs to the south, and an easy drive to Denver area attractions to the north. Powers Blvd provides access to eastern Colorado Springs shops and attractions. With its unparalleled views, spectacular homes, great schools and parks, Black Forest offers a scenic hideaway near to city amenities but secluded enough to find some peace of mind. Search the #1 site for Black Forest Real Estate listings.